SAN FRANCISCO — When NASA's next Mars rover touches down in 2021, its six-wheeled sister, Curiosity, may still be chugging around the Red Planet. NASA announced Tuesday (Dec. 4) that it plans to launch an unmanned rover toward the Red Planet in 2020, to help pave the way for an eventual Martian sample-return mission. The new rover will be based heavily on Curiosity, whose Aug. 5 landing kicked off a mission to determine if the Red Planet could ever have supported microbial life. 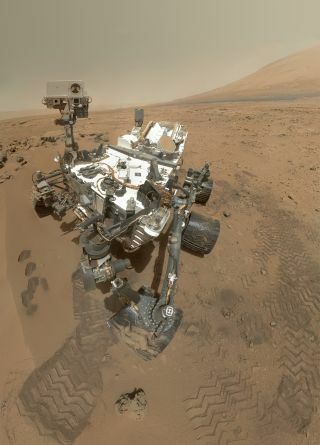 Curiosity's mission was originally planned to last two years. It has now been extended indefinitely. Just how long Curiosity could keep roving is an open question. The $2.5 billion robot is powered by a radioisotope thermoelectric generator (RTG), which should be able to continue converting the heat of plutonium-238's radioactive decay into electricity for a long time to come. "I never get a straight answer on this, but I think it has 55 years of positive power margin," Grunsfeld said. NASA will also keep its other Mars assets going as long as possible, Grunsfeld announced. These include the Mars Reconnaissance Orbiter (MRO) and the Opportunity rover, which are currently operating at the Red Planet, and the Maven orbiter and InSight lander, which are due to launch in 2013 and 2016, respectively. The extension applies to NASA's Mars Odyssey orbiter as well, but Grunsfeld said he doesn't expect the spacecraft to still be viable in 2021. Odyssey launched in 2001 and has been showing some signs of age recently. MRO launched in 2005, while Opportunity landed on Mars along with its twin, Spirit, in January 2004. Spirit and Opportunity were tasked with three-month prime missions to search for signs of past water activity, but both robots far outlasted their warranties. Spirit stopped communicating with Earth in 2010, while Opportunity is still going strong; it's currently checking out clay deposits along the rim of a large crater named Endeavour. It's particularly important for the 2020 rover mission to have functioning orbiters at Mars to help relay communications back and forth to Earth, Grunsfeld said. He expects that some combination of MRO, Maven and the European-led Trace Gas Orbiter (slated to blast off in 2016) will be able to do the job. NASA's goals at Mars combine both scientific discovery and human exploration. The agency wants to return pieces of the Red Planet to Earth so researchers can analyze them for signs of life. And NASA is also working toward sending astronauts to the vicinity of Mars by the mid-2030s, then putting boots in the red dirt sometime after that.